DESIGN: AGS-11/6 aerosol fire extinguisher generate dry aerosol cloud which extinguishes fire upon reaching necessary concentration in protected volume. AGS-11/6 aerosol fire extinguisher has steel cylinder body with nozzle gap around the side surface of the body or on the top depending on modification. 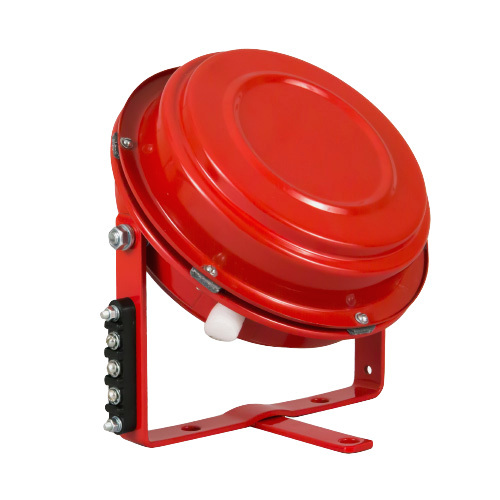 Despite compact size AGS-11/6 aerosol fire extinguisher has protected volume 48 m3. Outer aerosol stream temperature is lowered by air cooling. AGS-11/6 has a number of modifications with different aerosol stream direction. OPERATION: Electric signal activates the starter installed inside aerosol fire extinguisher which ignites the aerosol forming cartridge. Aerosol cartridge produce large volume of fire extinguishing aerosol streaming through the cooling layer and coming out of fire extinguisher through the nozzle. Thanks to its unique properties aerosol stops the fire and prevents following reignition. APPLICATION: AGS-11/6 is recommended for the protection of electronic equipment, electric cabinets, high-voltage power installations, various stationery or moving high-frequency devices, as well as vehicles, since it corresponds to the requirements for vibration loads on railway, road and air transport.